Annabel Greene spent her summer ignoring everyone and avoiding all of the things that are wrong in her life. So when she returns to school in the fall, she finds herself friendless and despised by nearly everyone, except for outcast and music-lover Owen, who reaches out to her. Trapped in a state where most everyone seems to keep quiet about everything--her sister's illness, family tension, an unwanted modeling career, and a night earlier that spring that won't be forgotten--Annabel is taken aback by Owen's determination to always tell the truth...and slowly he helps her realize that ignoring your problems won't make them go away. Once again, Sarah Dessen has created a very layered and intense book, full of pain and love and laughter and heart. Annabel is such an excellent narrator; she focuses on being the successful student and the ideal daughter in a picture-perfect family, even as everything around her is evidence that she is anything but perfect. Her friendship with Owen is a refuge, and with him, she's not afraid to speak her mind. And Owen, despite his anger issues and his struggles with communication with Annabel, is kind, caring, and his passion for music of any kind makes him stand out as a character. As Annabel is forced to work her way through the many problems in her life, Dessen slowly drops hints and reveals the big secret that caused Annabel to shut down, and builds the book up to a point where Annabel is forced to make a decision: speak out, or go on with her silent suffering. 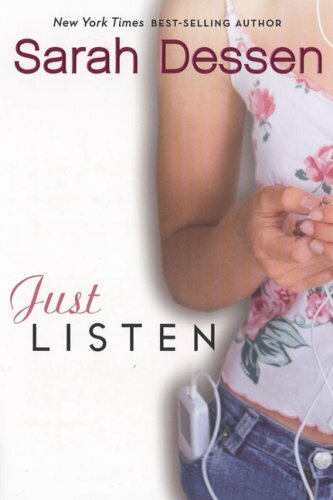 This book is heavy with symbolism, from the title to the final page, but Dessen never overdoes it--Just Listen is a beautiful, meaningful, and pitch perfect novel that will make readers Dessen fans for life. Cover Comments: I like this cover a lot, it is really relevant to what the book is about, and very pretty. However, I do think that the mp3 player does date the cover. When it came out a few years ago, I;m sure it was current, but now there are slimmer devices, and that one looks a little bulky and out of place. Nonetheless, this is a very nice cover. Review copy borrowed from the library. I loved the book for the same reason you mentioned. I think she did a great job of creating complex characters and giving us the genuine romance/connection that many of us have come to love about Dessen's books. I liked this book, and I liked Owen even though he was a bit of a music snob. There were many times when I wanted to hug Anabel and even her sisters. Lovely review - now I want to re-read. I've heard loads of good things about Sarah's books and I have two of them to read. I absolutely MUST read them soon! Haha can you imagine how dated this book will seem in 15-20 years with that old iPod on the cover? 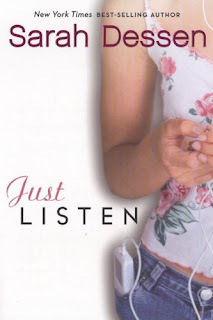 Regardless, Just Listen is my favorite Sarah Dessen novel so I'm glad you liked it! if you liked just listen, then you'll definitely love the truth about forever. This was the first Sarah Dessen book I read, and I became a huge fan before even reaching the halfway point. I've read some more, and have another one waiting in my to-read pile that I hope to get to soon. I've wanted to revisit Just Listen, and now I may have to pick it back up.